After two centuries of Christian art,the West has produced thousands of images of Jesus Christ—almost none of which connects to people who are alive today. The Son of God is usually portrayed as a man who was born to be tortured to death on a cross, but not as a man who could gather around him twelve apostles and hundreds of followers. One notable exception are the vignettes with Bernard Verley (above) as Christ in Luis Buñuel’s film The Milky Way (1969). The scene pictured above is at the marriage ceremony in Cana, when the Redeemer performed his first public miracle. 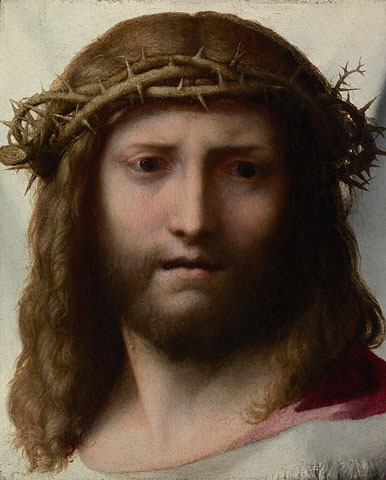 I like the look of consternation on Christ’s face as he contemplates what lies ahead while he is wearing the crown of thorns. This is the Christ who, the previous night at Gethsemani, had said: “My Father, if it be possible, let this cup pass from me; nevertheless, not as I will, but as you will.” He may be God, but the look on His face is 100% pure human.